26 February, Henry George Clopper Ketchum was born in Fredericton, N.B., the son of George Edward Ketchum and Mary Ann (Phillips) Ketchum. Entered King's College, Fredericton, N.B. on completion of studies at Fredericton Collegiate School. Ketchum attended the first engineering lectures given by English engineer Thomas McMahon Cregan at King's College. Ketchum was employed on the European and North American Railway, firstly on the Halifax to Bangor, Maine railway line as a surveyor, and secondly on the Saint John to Shediac railway line as assistant construction engineer reporting to Alexander Luders Light. In November of 1860 Ketchum was employed by James Fox & Sons as agent and district engineer on the São Paulo Railway in Brazil. Ketchum worked under British engineer Sir James Brunlees on several portions of the railway including the Santos/Jundiai line and the Megy Viaduct. 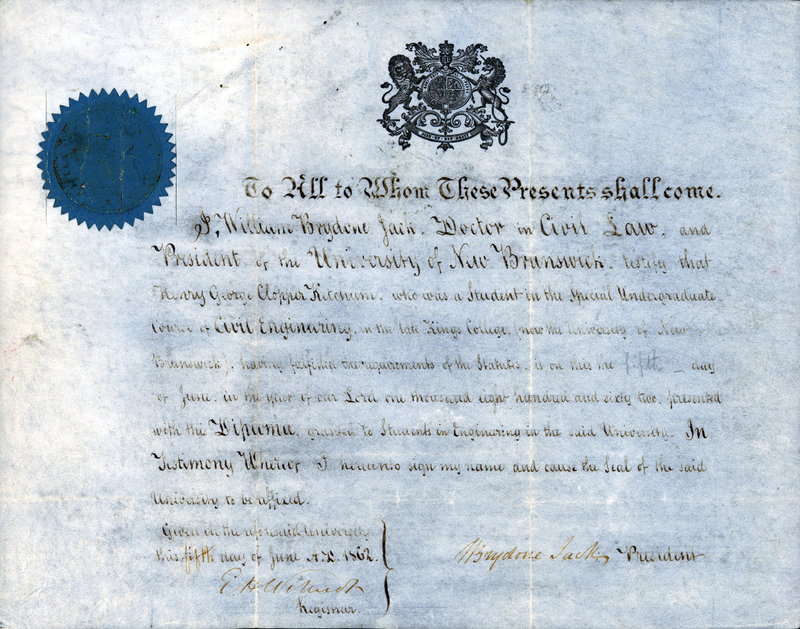 Ketchum was awarded the first diploma in Civil Engineering from the University of New Brunswick in June 1862. Returned to Canada after a brief stay in England. Took up employment as resident engineer with the International Contracting Company, N.B., who were sub-contractors on the European and North American Railway. Ketchum worked on the Eastern Section of the railway i.e., Painsec (near Moncton, N.B.) to Missaguash River (near Truro, N.S). International Contracting went into bankruptcy after an extended dispute with New Brunswick Premier Albert James Smith, and construction was taken over by Clark, Punchard and Company for whom Ketchum acted as a sub-contractor. In 1865 H. G. C. Ketchum purchased the "Elmcroft" property and land in Fredericton from the Hon. Neville Parker, a judge and former Master of the Rolls. Married Sarah E. Milner of Sackville, N.B., daughter of Christopher Milner and Elizabeth Morse in 1866. 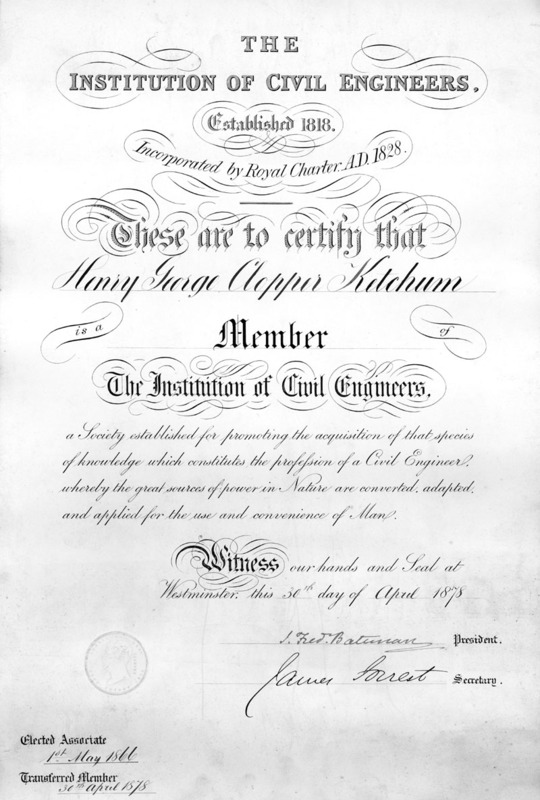 Awarded designation as Associate of the British Institution of Civil Engineers, England in 1866. 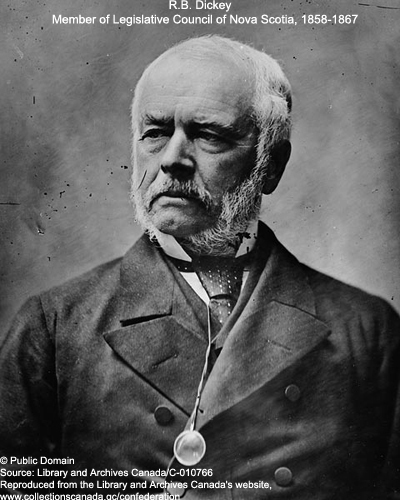 In 1869 he was named chief engineer for the New Brunswick Railway; Fredericton to Edmundston line. After, he was employed as section engineer on the Quebec and New Brunswick Railway; Fredericton and Woodstock to Rivière du Loup line. Ketchum began a private consulting practice in Fredericton. Letters written by Ketchum proposing a ship railway across the Isthmus of Chignecto, N.S., were published in the Daily Telegraph of Saint John, N.B. It was also this year that Ketchum presented his Chignecto Ship Railway plans at the Mechanics' and Manufacturers' Exhibition at Saint John, N.B., receiving a favourable response. All blueprints and plans relating to the Chignecto Ship Railway were destroyed by the Great Fire at Saint John, N.B. Awarded designation of Member of the British Institution of Civil Engineers, England. Personally financed and carried out a survey of the Isthmus of Chignecto. Ketchum presented the results to Sir Charles Tupper who was then the Minister of Railways and Canals in the Canadian Government. 1882 The Chignecto Marine Transport Railway Company was incorporated with Ketchum as the managing director. 1883 The land on which the Chignecto Railway was to be constructed was donated free of charge by the County of Cumberland. 1884 The Chignecto Marine Transport Railway Company requested from the Canadian Government an increase in subsidy from $150,000 to $175,000 over 25 years. 1885 Subsidy of $170,682 over 20 years approved by the Canadian Government on condition that the Chignecto Railway was completed by 1 July 1889. Although the Bill was passed by the House of Commons after a heated debate, additional penalties were attached to the subsidy. The contract which had been signed by the Chignecto Marine Transport Railway Co. Directors in England was en route for signing by the Canadian government when the ship carrying the document, the S.S. Oregon, sank after a collision near the coast of New York. The contract was eventually retrieved by divers and taken to Ottawa where it was duly signed. 1887 Work on the two docks sites at Tidnish Bridge and Fort Lawrence commenced even though finances had yet to be arranged. 1888 Canadian Government approved an extension of one year to the project completion date and John G. Meiggs & Co. (London) accepted the position of chief contractor; construction began on the Chignecto Ship Railway in October. In the same year, the Canadian Government passed a new Railway Act specifying that no bonds or debentures could be issued until one fifth of the cost of any railway venture had been spent by the private sector. St. Alban’s Church was constructed at Fort Lawrence to accommodate the large number of labourers arriving to work on the railway. The church was built by the railway labourers and the local inhabitants. 1890 Unfavourable economic conditions in the South American money market caused the collapse of the banking firm Baring Brothers (London), a company invested in by contractors John G. Meiggs & Co. The demise of John G. Meiggs & Co. resulted in the non-issuance of the remaining bonds. 1891 Work on the Chignecto Ship railway ceased as a result of the financial difficulties. Three-quarters of the work on the Chignecto Ship Railway had been completed i.e., the docks at Fort Lawrence and Tidnish Bridge; 16 of the 17 miles of railbed; and 12 miles of track. 1892 English Chignecto shareholders appointed Andrew Dryburgh Provand to press the Canadian Government to resume work on the Chignecto Railway. The Church of the Good Shepherd was built by Jacob Baxter on land donated by Robert Barry Dickey to provide an additional place of worship for the railway labourers and local people. The first recorded service was held on 21 Aug. 1892. Pearson & Sons (London) replaced John G. Meiggs & Sons as chief contractors on the Chignecto project. 1896 The additional $1,500,000 required to complete the Chignecto Ship Railway was raised by the English shareholders, but, despite the efforts of Sir Charles Tupper and Andrew Dryburgh Provand, the Canadian Government could not be persuaded to extend the time period for completion of the railway. The final House of Commons vote was 55 against versus 54 in favour. On 8 September, Ketchum died of a heart condition at age 57 in Amherst, N.S. ; he had signed his last Will & Testament only 10 days before his death. Ketchum was buried in a plot he had previously selected overlooking the Chignecto Ship Railway at Tidnish. At his wife's request, Ketchum's hearse was driven by Mr. John Cody of Charles Savage Livery Stable, the only driver Ketchum had employed to drive him whilst alive. Note: After Ketchum’s death in 1896, Andrew Dryburgh Provand continued to pursue the rights of the shareholders with the Canadian government, and to attempt to resurrect the project. This he did until his death in 1914. Atkins, Pearl MacD. “The History of Tidnish Bridge”. Amherst Citizen (4 January 1986). Bowes, Edward Chapman. “Henry George Clopper Ketchum”. Dictionary of Canadian Biography XII, pp. 484-485. Chapman, Sarah. "Chignecto Ship Railway". This document has been archived and can be found in "Little Known Portions of Nova Scotia History". Under Special Topics, click on Railways and scroll down to Sarah Chapman's document. Excerpt from “Minutes of Proceedings of the Institute of Civil Engineers - Vol cxxviii Session 1895-96 Part ii”. “Henry George Clopper Ketchum fonds”: University of New Brunswick Archives and Special Collections. Trenholm, Gladys et al. A History of Fort Lawrence - Times, Tides and Towns. Edmonton, Alberta: Sherwood Printing Ltd., 1985. Underwood, Jay. Ketchum’s Folly. Hantsport, N.S: Lancelot Press, 1995. “The Writings of W O Raymond”. The New Brunswick Historical Journal (Summer 1991).